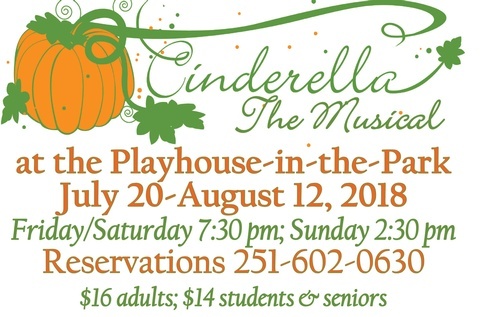 Name: "Cinderella - The Musical"
This summer, The Playhouse-in-the-Park presents our original musical "Cinderella - The Musical." Enchanting special effects bring this beloved fairy tale to life in a colorful, rags-to-riches romp perfect for the whole family! "Cinderella - The Musical" will run from July 20 through August 12, 2018 on Fridays and Saturdays at 7:30 pm and Sundays at 2:30 pm. The Playhouse-in-the-Park has trained young people in theatre arts since 1961! For further information on upcoming performances as well as acting, music, and dance classes, visit the website listed above. Tickets are $16 for adults and $14 for children, students and seniors. Reservations are recommended; please call 251-602-0630 for details.